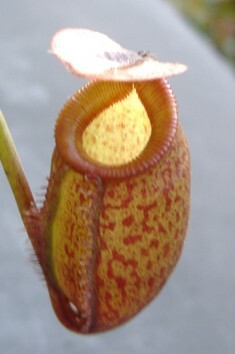 Nepenthes talangensis X mira is an Exotica Plants hybrid between a two highlanders. Both parent species are rather slow growing and that might explain that this plant arrived as a smaller offering from Exotica Plants than some of their other hybrids. I'm growing outdoors as a highlander in partial shade cloth without any issues. I like Exotica's hybrids that use N. talangensis so that's why I got this plant. It's still a size 3 and hasn't done anything spectacular yet. The peristome seems ridged that comes from the N. mira in it. From the looks of things so far, it will be a year or so for me in my growing conditions before larger pitchers are produced. But for now, this hybrid seems trouble-free and an easy grower.